A sweet and succulent collection of modlets I've created. I've been fairly active and have multiple ideas I want done. Stay tuned and check back often!!! This mod is for those that want to increase those stack sizes of various items. I play with higher loot drops and most servers do this as well. This is to make sure you can stay scavenging longer and to keep things as consolidated as possible. These stack size increase choices have been influenced by the awesome Youtuber Z-Nation FFS and his videos. Please let me know your thoughts on the increases and if you have any suggestions on a size. 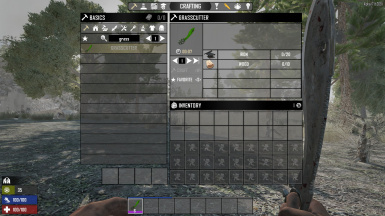 If you would like to customize this mod to stack sizes of your liking, you can edit the items.xml file in Config folder of this download, I tried to document the file as much as I could, for easy customization. 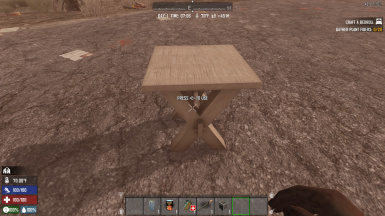 MP: Just needed on server side. Adds a handy dandy machete shaped colored green item called the GrassCutter. Some call it a lawn mower though :/. For easy cutting of grass in a large area. Recipe is made simple as this tool really is only used for grass cutting. Does 1dmg on blocks (as you can't have 0) and 1dmg on entities (Zomberts and Almanals). Repair with Scrap Iron. Created an item that will help with your Casino Coin overflow. After acquiring the first Barter level, you gain the ability to craft Duke's Voucher. 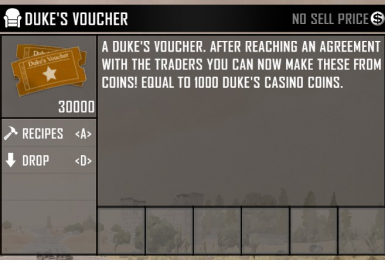 The Voucher can be quickly and easily crafted back to Duke's Casino coins and vice versa. I have also added these to be found in loot containers. Can be found in the same locations as the Coins, for example the treasure chests and cash registers, ect. Enjoy! MP: Needed on server side. Since a custom icon is added, client side is highly recommended, otherwise the icon is blank. You ever get that moment where you start crafting items that take forever to finish and you don't have your Workbench yet. Well, I have created a helping hand for you. 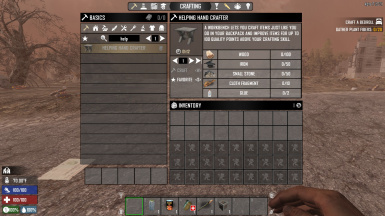 The Helping Hand Crafter allows you to queue up item crafts without taking up your precious personal crafting queues. After Intelligence level 3, you can now craft these helpful little buggers. Enjoy! What really baffled me and what pushed me to make this modlet, was the super imbalance of XP given based on health of enemies. A great example is a Radiated Female Fat zombalina has 722 base health and is only worth 900 XP, while a Feral Zombie Soldier with 285 health is worth 1000xp!! What this modlet does is give experience based on the health of the enemy. I scaled this at 4xp per HP as it seemed to have fit perfectly imo. Normal zombies have 150hp, so you would get 600xp instead of 550xp. Feral zombies have 235HP so you get 950xp instead of 700xp. Oh, and that zombie bear that you wish you never run into and usually run away from, has 1000hp, this one of the highest health enemies in the game, and yes it does give you 4000xp instead of a pathetic 800xp. This may look excessive at first, but when I ran into one and killed it, it was super disheartening to only get that 800xp. Getting that 4000xp is a WELL deserved reward after facing off from that and also give incentives to kill it than running away. I'm using this right now with a buddy and the progression DEFINITELY seems more balanced imo. This modlet is also very customizable. I have tried to document my XML file to the best of my abilities so you can edit it to your liking. Edit the enitityclasses.xml file, preferably with Notepad++, and you will see the changes are labeled and in sections. Enjoy! SO! Solar panels has been a thing in 7 Days to Die since A16. Makes sense as that is when Electricity was introduced to the game. I was a bit surprised when I learned they still haven't created a crafting recipe for these Solar Cells that are GOD AWFUL expensive from the trader. I took this to my own hands. This modlet adds the ability to make solar panels! BUT! (That's a big but ;P) I've been the type of person to try and keep things balanced for the game. Sorry I am not sorry for the path I have chosen to craft these solar cells >:D.
FIRST, I wanted to change some naming for better accuracy. I renamed the "Solar Cells" to "Solar Panels" and "Solar Banks" to "Solar Arrays". Next, I added 3 items that will be used as parts to craft the solar panel. Solar Cells - Crafted in the Chemistry station. Solar Panel Frame - Crafted in the Workstation. 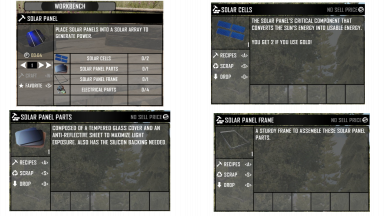 Solar Panel Parts - Crafted in the forge. Oh, this is also gated by Yeah Science 5.... Cause harnessing the power of the sun seems a bit.... "Complex"
Solar panels are also supposed to be super late game. I did drop the level needed for the Battery bank to Yeah Science level 4 to accommodate this change. Instructions for this are extremely straight forward, but you can find the instruction at the bottom of this post. PLEASE make sure to run this as it adds all the names and descriptions. MP: Needed on server side. Since custom icons are added, client side is highly recommended, otherwise the icons are blank. Recommend replacing RussianDoodABW with the new version on the new post. Stay tuned to... well this page... more to come!! Copy the folder of the Modlet to the Mods folder in your 7D2D Game Directory "\steamapps\common\7 Days To Die" (If Mods Folder is missing, create it).